FCL055 Features: -Electric powered with a line cord. -Weatherproof. -Pump included. -Durable polyresin and fiberglass construction. -Backside is flat. Finish: -Multi Colored. Material: -Fiberglass/Resin. Number of Items Included: -2. Style: -Traditional. 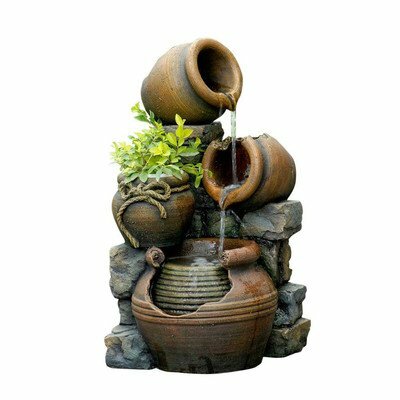 Fountain Design: -Tiered. Fountain Function: -Floor. Fountain Location: -Outdoor/Garden. Pump Included: -Yes. Commercial Use: -Yes. Material Details: -Polyresin. Power Source: -Electricity. Generic Specifications: -Holds 3-5 gallons water. -Output: 110V. Dimensions: Overall Height - Top to Bottom: -23.6". Overall Width - Side to Side: -13.4". Overall Depth - Front to Back: -12.6". Overall Product Weight: -15.4 lbs.